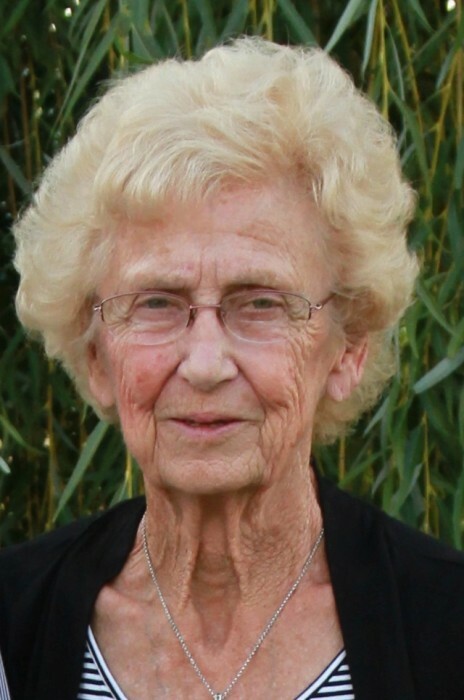 Anna Lee Stephenson, 88, of Rockford, Ohio, died at 8:20 p.m. on Wednesday, June 20, 2018, at the Laurels of Shane Hill, where she was a patient. She was born in Celina, Ohio, on August 11, 1929, the daughter of Elmer and Mildred (Monroe) Hoenie. She was a graduate of Celina High School, and on February 19, 1949, she married Charles L. Stephenson, and he survives in Rockford. Anna Lee was a homemaker, and also enjoyed working beside Charles, farming their land. She and Charles were married for almost 70 years, and enjoyed every minute of their time together—it went much too quickly. She was a member of the Chattanooga United Methodist Church, where she was very active in all the church’s activities. She was past president of the U.M. Women’s Society, and taught Bible School and Sunday School for over 50 years. She especially loved her family—her three children and their families. She taught every one of them growing up on Koch Road how to ride a bicycle. The kids loved to hang out at Charles’ and Anna Lee’s home, especially because they had an in-ground pool, and that was very popular with all the family. Anna Lee would cook up a huge table of food for all the kids and their friends who came over to swim; it seemed like an awful lot of that pool water ended up in her kitchen, but she never minded it. She was even known to have patched up some of the boys who camped out in the woods, after their bottle rocket fights, so that when they went home, their parents were never the wiser. She loved flower gardening in the Spring, Summer, and Fall, and when Winter rolled around, every Sunday night, she, Jane and Judy would be quilting, and eating some of her homemade raspberry pie and maybe a pizza. Surviving in addition to her husband, Charles, are her three children: Jane (Phillip) Suzuki of Rockford, Judy (Kirby) Stetler of Celina, and Michael (Janice) Stephenson of Fort Wayne, Indiana; her six grandchildren: Tyler (Cindy) Suzuki, Matthew (Tami) Suzuki, Jessica (Troy) Temple, Sarah (Theo) Belcher, Zachary (Molly) Stephenson, and Susan (Kreshnik) Seiti, along with 16 great grandchildren, all of whom she loved dearly. Services will be held on Sunday at 3:00 p.m. at Ketcham-Ripley Funeral Home in Rockford, Ohio, with Pastor Tom Brunstrupp officiating. Burial will follow in Buck Cemetery, Celina. Friends may call at the funeral home on Sunday, prior to the service from Noon up until the time of the service. Memorials may be directed to the Chattanooga United Methodist Church. Condolences may be expressed at ketchamripley.com.